There are lots of ways to push yourself up, meaning that there are lots of ways to do push-ups. There is the standard way, in "plank" position, and variations that make the exercise easier or more difficult. Any push-up will work out the triceps, chest, back, shoulders and, to a lesser extent, the legs. They will not help you build bigger biceps. Pushing with your arms works the triceps, the muscles on the back of your arm. 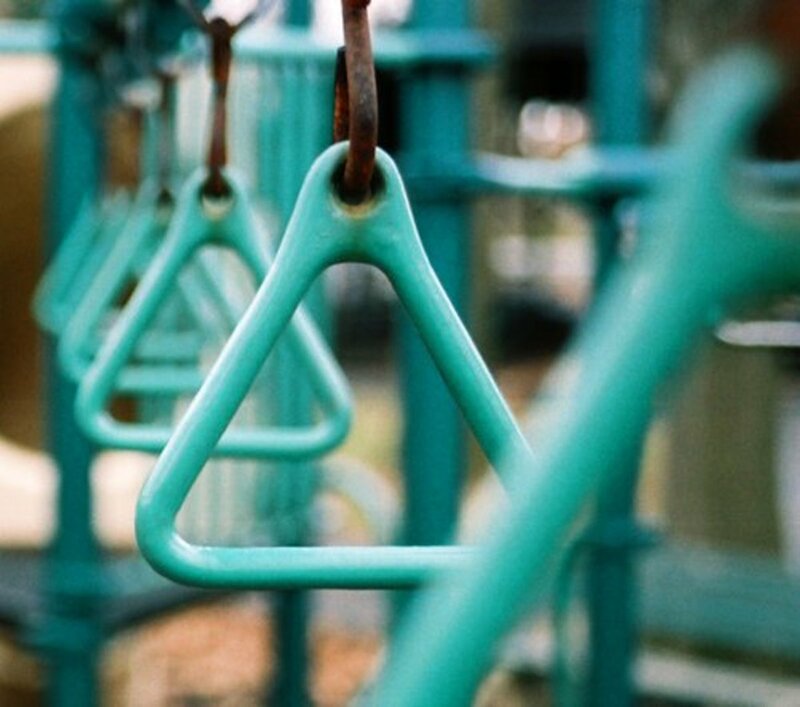 To work your biceps, you need to pull, not push with your arms, for example by doing pull-ups and chin-ups. Most push-up variations require no equipment and very little space, so you can just drop down and do them almost anywhere at any time. 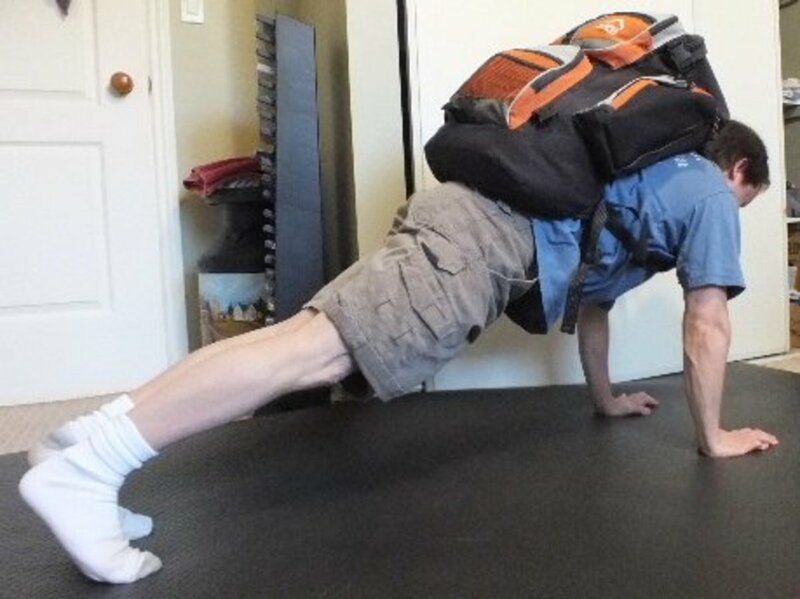 Some variations require a set of stairs, an exercise ball, or a heavy backpack. The challenge I was interested in was 100 push-ups, almost every day, for six consecutive weeks. Would this challenge be enough to change my appearance and significantly increase my strength? Would I like the results? To answer these questions, I tried the challenge myself. You can try it for yourself at home, with any push-up variation you're comfortable with. 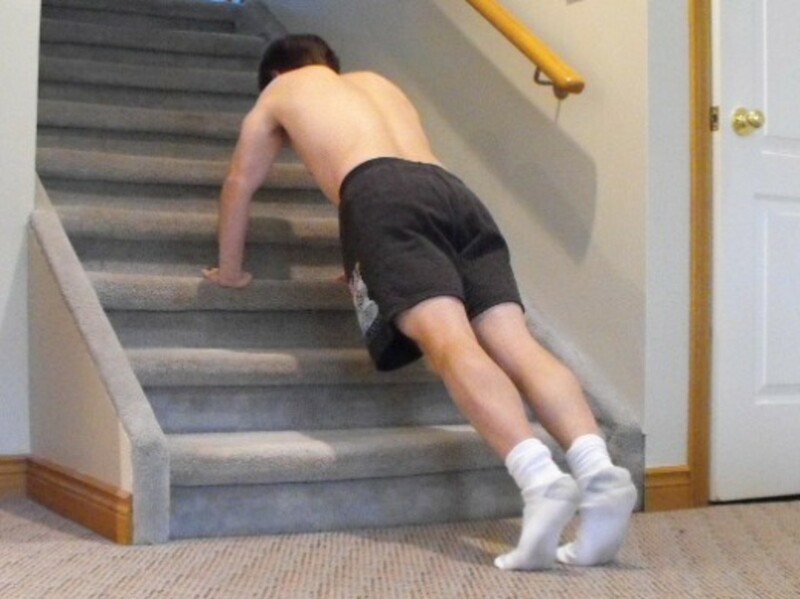 Using the incline of a set of stairs is an easier way to do push-ups. What Kinds of Push-Ups Should You Do? When people think of push-ups, they usually think of the standard "plank" style. To do a standard push-up, drop down onto your hands and move your feet back while keeping your body off the ground. Lower yourself so your chest is almost touching the floor. Raise yourself back up so that your arms are nearly fully extended. This completes one repetition. But to get the most out of the challenge, don't limit yourself to the standard push-ups. Try different variations so you can continue to challenge yourself. I tried some difficult variations, including push-ups with my legs in the air. 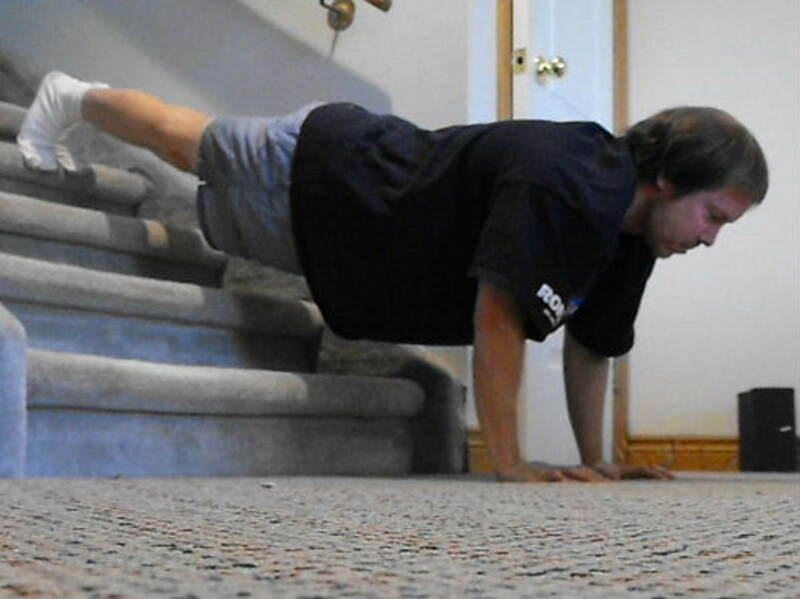 For an easier push-up, use a set of stairs (as above). Add weight by wearing a heavy backpack. This makes push-ups more challenging and helps build muscle mass. You can also add a limited amount of weight. Doing as many as you can at once is good for improving your endurance. If you are not challenging yourself you are not changing your body. Just going through the motions, doing the same routine over and over again, will probably not do much to change your body. To do that, you will have to either burn more calories or lift more to build muscle. There should be some pain, though if there is a lot of pain you are probably straining your muscles too much. If you want to build strength, twelve reps or less per set is a good goal. To see if I could bulk up doing push-ups I switched to some variations that required more strength. I increased the difficulty of each rep to build more muscle with fewer push-ups. Doing push-ups with your feet in the air can be extremely difficult. It may seem impossible. Make it possible by progressing from one exercise to another. Push up and lift your full body weight. For a while, doing push-ups was enough to change my body. My triceps and chest muscles became bigger and more defined. My abs became firmer. I increased my strength and endurance. However, the results were very limited because I was not increasing the weight I was lifting (my body weight). My appearance did not change very much, and neither did my strength. It felt like a good workout. The push-up routine strained my muscles and tired me out. After the workout, there was some muscle pain. My body needed to heal. At the same time I felt pumped up. That is a good sign. To build muscle, you'll initially cause some minor damage and then let the muscles heal. Doing that over and over again makes the muscles bigger and stronger. I needed to modify the workout to keep it challenging. That proves that my body was changing. If the push-ups were not building muscle, then I would not have needed to change the workout to stop it from becoming too easy. I could tell that my strength and endurance increased. However since the weight I was lifting was not increasing, it felt like I was mainly improving my endurance. Doing a lot of push-ups is good for toning only. However it will not get you ripped if you're looking to bulk up. You are not going to get big doing 100 regular push-ups 5 or 6 days a week. They will become too easy before that happens. Your appearance probably will not change very much. If you want to build muscle mass then you need more resistance. If you want to slim down than you should also do a lot of cardio. Before you start a new workout routine, it is a good idea to take a “before” picture so you can compare to how you look over time. It is a good way to check your progress. If your strength or endurance increases, then you are making progress. It means you are building muscle. You can measure the size of your muscles with a ruler or measuring tape. Remember that fat covers your muscles, so losing fat can make your muscles seem smaller while gaining fat can make your muscles seem bigger. Your exercise performance and your before-and-after pictures are probably better measures of your progress. Fat and weight loss. A push-up routine by itself is not enough to lose a significant amount weight; in fact, it is more likely to cause you to gain weight as you build muscle. Although push-ups can help you lose fat, because cardio and strength training together work better than cardio, if you are exercising to lose weight you should be doing cardio. Exercises that give the legs and cardiovascular system a good workout burn the most calories per minute and help most with weight loss: for example, running, biking, jumping rope, and step-ups. Rest is crucial. If you continue to challenge yourself but don't seem to be getting stronger—that is, your performance stays the same or even decreases over a few days—then your muscles probably need more time to recover. Exercising too much can stop you from building muscle. So can a lack of good quality sleep. Your muscles heal and become stronger while you are sleeping. There’s a limit to the amount of weight involved in a push-up. On a bench press, it is easier to add weight or change the weight. Lots of people say that weightlifting is far better than push-ups for building muscle. Of course most of these people never gave push-ups a chance; that is why I wanted to find out for myself by doing the challenge. When your balance is a little off one side does most of the work. Also, people tend to use their dominant hand & arm more when they exercise. One sided growth is common because people tend to exercise one side more. You can fix it by focusing on the left side. As far as I know, one sided growth is not normal unless you are working the one side more. Balance exercises might help. 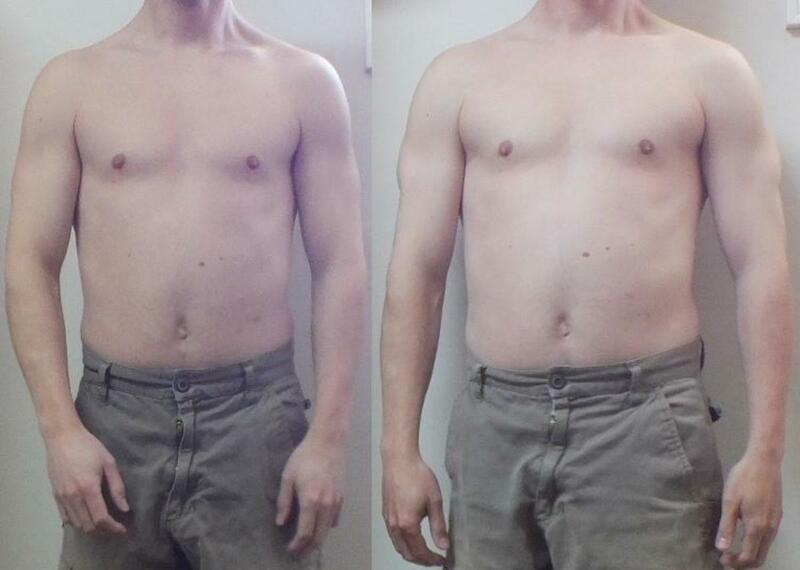 i did press up for about 2 months and discovered that the muscle under my right breast was growing and put on weight. This one sided grow is it normal? I like to do 100 push ups before each weight routine, then 100 after, sometimes I do weight routine first, then 200 push ups. One good way is do as many in a row as possible, if you do 50 in a row, wait 50 seconds to do more, if you pump out 25 more , wait 25 seconds. How ever many you have left, take that many seconds between. This has helped me big time, good way to spark up a dull routine. I do lots of push ups and I found that the main change in my body came in having bigger shoulders which I found just fine. Very interesting hub mikejhca. I have always done push ups since my army days, but have never actually isolated doing just push ups, but I have read they are very effective. 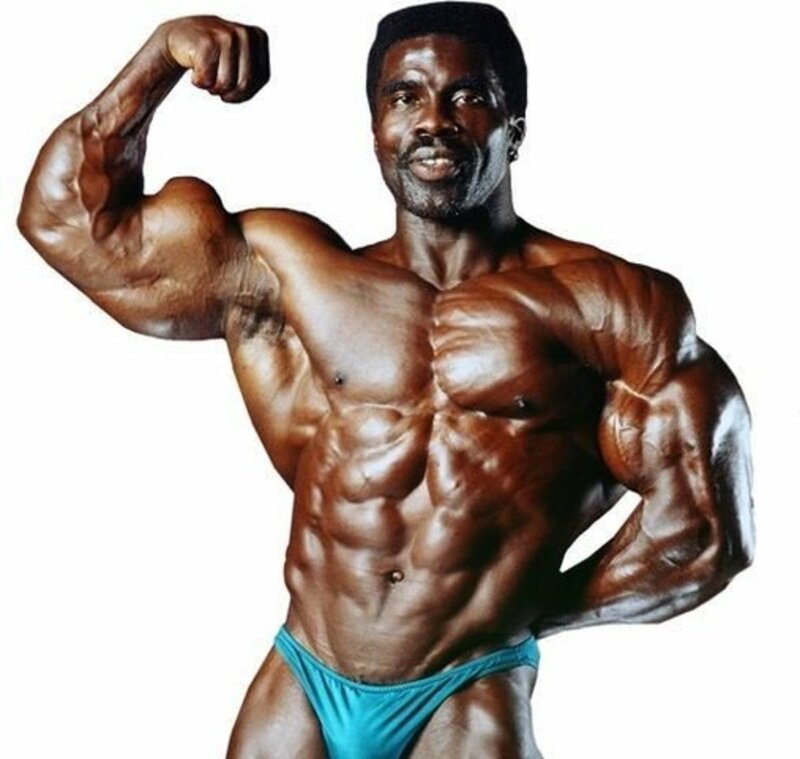 Hershel Walker allegedly did 1000 push ups a day and never used weights. Thumbs up on your hub.